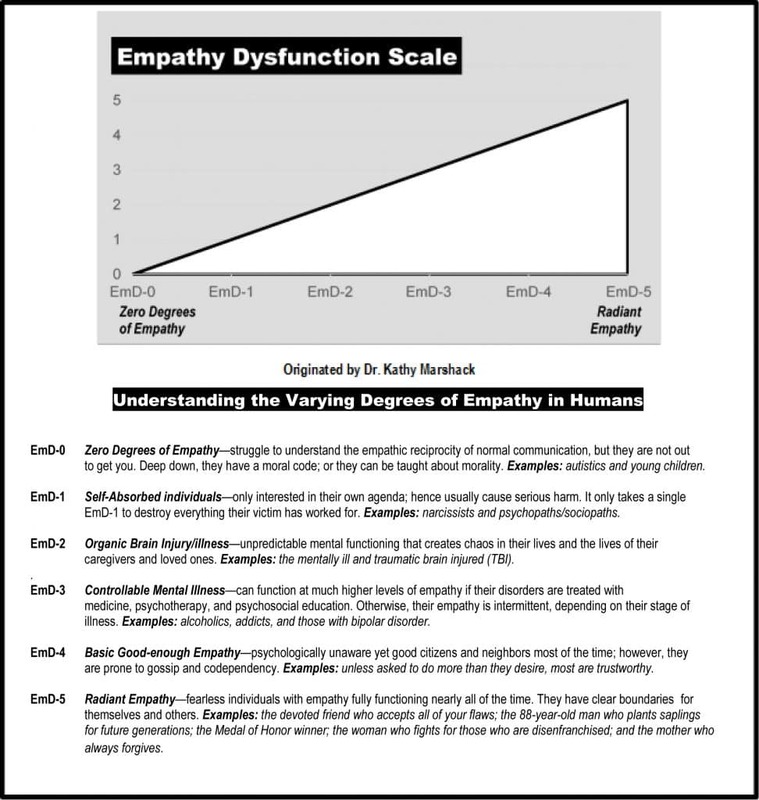 Empathy Dysfunction – Kathy J. Marshack, Ph.D. If so, you’ve crossed paths with someone operating with Empathy Dysfunction (EmD). 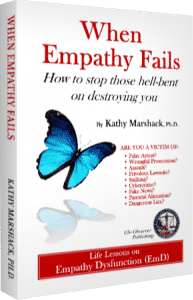 Dr. Marshack has released a new book, “When Empathy Fails: How to stop those hell-bent on destroying you,” to help you go from a helpless victim to fearless and filled with Radiant Empathy. Whether you buy the book, or join Dr. Marshack for a private video conference, her promise is to make you tougher, wiser, and yes more loving, even in the face of someone with Empathy Dysfunction. “Empathy: Everyone has at least a little, right? It seems a lifetime ago (starting on Sept. 11, 2001) when I began the journey that would prove otherwise. What I discovered led me to create a scale that measures the amount of empathy or lack thereof. I call it the Empathy Dysfunction Scale (EmD Scale). It’s a tool that teaches about the range of empathy—from none to a lot. “This unique Scale demonstrates how to protect yourself from those without empathy—people who seem out to get you. These were the kind of toxic people who catapulted me into years of horrible pain and loss. “My setbacks, mistakes and successes are captured and documented in “When Empathy Fails.” No person should have to endure the trauma and agony I did at the hands of people mired in Empathy Dysfunction! If reading my story of mistakes and triumphs helps you to navigate around the empathy-lacking people in your life, then I consider the outcome of my perilous journey to be a win. “I hope you can appreciate your life’s journey, too. It is a miracle; because you have free will, you have the opportunity to choose right from wrong. And because God loves you, you keep getting more chances to get it right, even if you miss it the first or the fiftieth time. No matter, it is striving to do the right thing that is important. Free will and the chance to make conscious choices are powerful tools along the path to enlightenment. Individuals without empathy are some of our best teachers. “Forgiving myself for all of my mistakes is an ongoing process since, like all humans, I keep making poor choices; however, each time I forgive myself, I see other options. Self-forgiveness is essential to rebooting your life especially when others may not forgive you. As you read this book and discover how I negotiated a perfect storm of ruthless people—people who shamed and abused me—you will see that forgiving yourself is essential to your survival. I dreamt that I was swimming in the ocean on a beautiful sunny day. Others were swimming and surfing also. I could see them in the sea just a few hundred yards from the wide sandy beach on the Oregon shore of the Pacific Ocean. It was bordered by boulders and forest. Suddenly, a massive tidal wave was heading our way. The pleasant summer swim turned into panic. We swam madly for the shore but couldn’t escape. I watched in horror as the wave caught the swimmers, then me, tossing us violently onto the rocks and into the trees. Everyone was killed. In the next dream scene, the group of swimmers was sitting in a classroom discussing the event. Our teacher was asking how we might have prevented this disaster. It was peaceful in the classroom—as if our deaths were not the issue. I don’t recall what the group discussed. Again, I found myself swimming in the ocean and thoroughly enjoying myself—until a tidal wave swept me up and killed me on the rocks. Then there I was, back in the classroom with a new bunch of people, still trying to reason out the lesson in the deadly waves. The dream sequence happened a few more times before my “dreaming self” took a different tack. This time, as I watched the panic set in, I decided to fly up out of the ocean like an eagle and soar over the rocks and trees to safety. As I soared, I looked down at the terrified swimmers and wondered why they hadn’t realized how easy it is to escape certain death. On returning to the classroom, I found no one there, not even the teacher. “I awoke from the dream to the realization that life is a perpetual discovery of who we are. More importantly, we are being called to be our true, authentic self. “WHEN EMPATHY FAILS,” is a book title with a caveat: My daughters still won’t forgive me the years of toxic battles and the accompanying trauma and drama that stole their childhood. They refuse me any contact, meaning I’m estranged from my young grandson as well. “Dozens of people call me “Mom,” including young friends and clients. A 9-year-old client of mine asked his mother if he could claim me as his grandmother since his own had passed on. In a heartbeat, I accepted! I am blessed and proud to be Mom and Grandma to those who need me and genuinely love me. It is an honor. “My fervent hope is that you will read this book and learn that you are blessed even if you are enduring the pressure of defending yourself from: hostile neighbors; a vindictive ex-spouse; wrongful prosecution; or hurtful actions by ungrateful children.